With nine million people caught by the double-whammy of soaring house prices and stagnant wages, landlords have a ready supply of lifelong tenants. Even with the government’s Help to Buy subsidies, many are still struggling to save the required 5% deposit and face renting for the foreseeable future. Residential landlords are also able to take advantage of various tax breaks that are not available to owner-occupiers. The main break being that all costs for owner-occupiers are paid out of income after it has been taxed, whereas landlords can claim generous allowances via self-assessment to offset their tax bill. The generous tax treatment of landlords equates to a total subsidy of £5bn a year from every taxpayer. It is no surprise therefore; that around 4% of UK adults are landlords and 17% of our MPs are landlords, meaning it is unlikely the landlord’s current tax breaks will change anytime soon! Landlords can deduct all interest payments on their buy-to-let mortgages from rental income. A further 10% is allowed to cover depreciation and repairs, even if no upkeep has been required. All other expenses related to letting the property such as letting agents’ fees, legal fees etc can also be deducted from rental income. But it isn’t all good news. Landlords are facing a growing number of new rules and regulations they need to comply with. There is a legal duty placed on landlords to ensure that gas and electrical appliances are kept in safe working order. A Gas Safety Certificate is required (each year) for every gas appliance in the property. Landlords also have to supply energy performance certificates for the property if a tenant asks for one. Tenant’s deposits, usually around 4 to six weeks’ rent, must be deposited in one of three government-backed deposit protection schemes within 30 days of receiving it from the tenant. Failure to do so could result in a fine of up to three times the value of the deposit. It is vital that landlords use the right type of contract. Assured shorthold tenancies give landlords the right to take back the property by giving the tenant two months’ notice, but only after an initial six months. Increasing the rent may not be straightforward either. The amount a landlord can charge for rent will depend on local market factors and the demand in each area along with the size, condition and facilities of the property. Rents can only be increased at the end of the fixed-term contract when it is up for renewal. For rolling weekly or monthly contracts, it may only be possible to increase the rent once a year. All repairs are still the Landlord’s responsibility when the property is let. It is essential that landlords maintain their properties to ensure that any small problem does not end up creating a much bigger problem – for example ignoring a plumbing leak! Letting agents: The first thing to make sure is that the letting agent is a member of the Association of Residential Letting Agents (ARLA). At least they have a code of conduct, but be aware it is voluntary! Many landlords use the services of a letting agent in return for waving goodbye to around 10%-15% of the rent they receive. Tenants are also typically caught for fees around the £350 mark, with some unscrupulous letting agents charging annual fees, or a fee each time the rental agreement is renewed. Landlords can also face ongoing administration charges too. Letting agents can be useful for landlords, for finding suitable tenants, taking up references, conducting credit checks on tenants, drawing up rental agreements and compiling inventories. 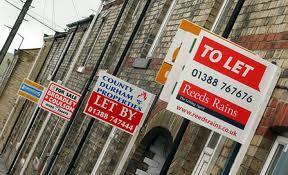 The fees a landlord is charged depends on the level of services the letting agent provides. They can act also as a go between for both landlords and tenants if there is a dispute. Like estate agents, they are an unregulated parasite, making their living from both tenants and landlords alike. At least the landlord can deduct their huge charges and fees from his tax bill! This entry was posted in Letting and renting and tagged landlord, letting, renting, tenant. Bookmark the permalink.